I just learned today that my favorite FTP client in Windows is now available for Linux in the form of their upcoming release. I was pretty stoked when I learned of this, because gftp is alright, but it ain’t great. Since I run Debian, I did a simple apt-get install filezilla and wham-o, there it was. The downside of this install is it is beta 2 and Filezilla 3 is currently at beta 5. I may try to compile it myself if the beta 2 gives me any problems. Update: If you want to install Filezilla from the Deian respositories, you will need to be running Testing(Etch) or Unstable. It is not in the current stable repos. Over the weekend I installed Ubuntu Edgy Eft Knot 3, OpenSUSE 10.2 Alpha 4, Fedora Core 6 Test 3, and Microsoft Vista RC1. I wanted to also test the latest Debian Etch build and Slackware 11 RC4, but time did not allow. In the end, the one I left installed the longest was Fedora, in fact it is still running on my main system. Maybe my hopes were just too high for this distro, I’ve really been wanting to try for quite some time, but man, what a let down. Right from the get go it didn’t recognize my mouse properly so I had to go through the entire install using keyboard navigation. Then when the system was finally running I needed to edit the /etc/X11/xorg.conf file but OpenSuse does not install pico or nano by default. I’m not familiar with any other text based editor. So I had to use vim to edit the file. I’ve never used vim, but I found a Redhat Linux 7.2 Unleashed on my shelf that had just enough info on vim for me to be able to edit and save the file. But it still took a lot of trial and error to get the mouse driver configured properly. Once the everything was working I didn’t know really what to do. I’ve never used a SUSE distro before, so I was just a bit lost. I didn’t feel like try to figure it so I just moved on to the Fedora install. I will try it again, but I will wait for the final 10.2 release. While the new upcoming Windows release to me is really no big deal, I was slightly interested to see what we’ll be in for starting early next year. The install was pretty smooth. I don’t know how long it took, as I started the install and left the house for a bit, but it was ready to go when I got back. I was really impressed how well it ran on my computer, I was under the impression that it would be boggy on anything but the most modern equipment. At no point did it ever feel slow. The initial downside, was that the install did not install the NIC driver. This was surprising because my machine has a pretty old, but popular 3com network card. I ended up enabling the onboard NIC which it recognized just fine, then I was able to go to Windows Update and get the driver for the 3com installed. That was the only issue I experienced. I was able to get it connected to my domain with no issues. It will take some getting used to some of the changes but over all it worked well. Also installed the new alpha release of Ubuntu Edgy Eft. Nothing major to report here. It’s still brown. I did get XGL installed and working but the effects really seemed to weigh down the performance of the computer and even caused it to lock up a few times. That was the first time though I was able to try XGL. 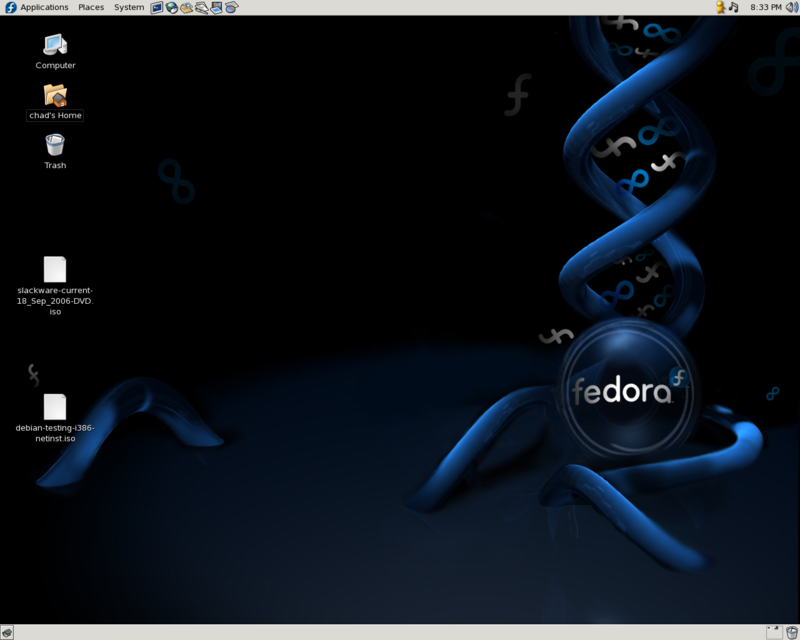 Lastly was was Fedora Core 6 Test 3. I really like the look of this release. Although as I’ve been living in the Ubuntu world for quite a while now, it took some figuring out how to get some stuff installed on this pre-release, such as mp3 support and flash. I did all these installs on Saturday and FC is still installed on my main machine. I also got XGL running here, and runs tens times better than the Ubuntu build. No lock ups or slow downs with it. What I would really like to see would be Ubuntu with the asthetic stylings of the Fedora Core 6 release. The themes and overall looks of FC6 rock!